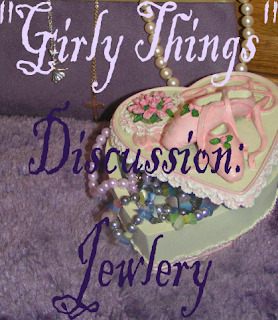 In the busyness of life, posts in the "Girly Things" Discussions got laid to the side for a while. However, we're hoping to bring them back! As always, if you have a topic you'd like to see discussed, please leave a comment and let us know! "we'll state a topic, and Miriam and I will each give our opinion of it. In the comment section, we would enjoy hearing your thoughts as well! Please keep in mind that our answers are not laid-down rules that everyone should follow. They just reflect our thoughts and experiences." My philosophy for jewelry is the same as my philosophy for many other "girly" things: keep it simple. In fact, I rarely wear jewelry, simply because I forget to put it on. Plus, it sometimes gets in the way, especially when I have to do a lot of movement. Wearing jewelry can help accent one's femininity, and it can be fun to match jewelry with an outfit. It's a fun thing for a girl to do, and it makes me feel like a lady, so I may try to start actually thinking about it and wearing it more often. =) However, we should be careful not to go overboard or draw too much attention to ourselves by wearing loads of flamboyant jewelry. Each one will have their own particular taste in what they like, but there can be a too extreme side, whatever your style may be. Jewelry can either look overdone and too busy with an outfit, or it can be the finishing touch that draws everything together. There are two items that I wear almost entirely. My watch I wear on my left wrist, putting it on each morning soon after I get up and taking off each night right before I go to sleep (I have to, or the ticking in my ear keeps me awake!). My watch is fairly simple, brown and gold, with dots for each minute and 12 large numbers, that suits my personal style. I like being on time and not having to pull out my cell phone every time I want to see a clock. I also always wear my purity ring on my right ring finger, only taking it off when I am doing something that will be messy or in dance class, since they don't like us to wear jewelery for safety reasons. Then, I usually take off my watch as well and put the ring on the watch band, buckling it so that the ring doesn't get lost. I don't have that much jewelry, but I have a few staple items that I enjoy wearing with certain outfits: a simple gold cross, a swirly silver cross, large and small pearls, and a necklace with a liturgical dancer on it. I also enjoy wearing a gold heart with jewels on it that was my grandmothers - it's special to me for that reason, and because it's simply lovely. The goal of a necklace should not be to draw attention to your chest, but rather to draw the attention upward, to the face. For this reason, sometimes I don't wear a necklace in order to give a more simple look. I also tend to avoid longer necklaces, for they sometimes hang on the body in attention-drawing ways. If you're wearing a top that is too low in the neckline, a necklace will accentuate this even more. The solution? Wear something with a higher neckline! I also don't wear earrings because my dad doesn't like pierced ears. He has decided that I can't pierce my ears until I'm 21, and I've learned to be at peace with that, although for a while I really wanted earrings because I thought they were so pretty! Now, I think I'll probably just wait and ask my husband (whenever I get married) what he would prefer. If my dad has such a strong dislike for them, I may as well wait a little while longer and ask my husband his preference (if he has one). As for other piercings, I have never desired them. Yes, nose rings are mentioned in the Bible as well as earrings, but I have never found them attractive. That goes for lip, eyebrow, upper ear piercings, etc. I think they can draw too much attention to themselves and be seen somewhat as a symbol of rebelliousness. In regards to belly button piercings, why would you want to pierce something that you would never show in all modesty? I hesitate to establish hard and fast rules about these things, but personally think that piercings beyond earrings should be avoided. The Bible doesn't condemn jewelry. In fact, it has examples of them being given as gifts to Godly women, and beautiful women are described as wearing some. However, it does say that our beauty should not come from jewelry. Instead, our beauty should come from inside, and from the good deeds that we do for God's glory (1 Timothy 2:8-9, 1 Peter 3:3-4). As with other things that you wear, when you put jewelry on, ask yourself what motivations you have for wearing it. If it is to draw attention to yourself, or to delight in the femininity that God placed inside you when He made you a woman? Again, I would encourage you to ask your authorities (your mom, dad, or husband) what they like and try to honor them with what kinds of jewelry that you wear. They may not have any preferences, or you may be surprised to discover what they enjoy you wearing! Like Anna, I wear very little jewelry. Up until a few years ago, I found it just a big nuisance and never bothered with it (except for my watch, which I wear all the time and have since I was 13). My watch has gold-colored metal band and a very simple watch face. I've always liked necklaces, and have three crosses that brothers gave me for birthdays. I actually have more necklaces than anything because it seems to be popular to give a girl that if you can't think of anything else...I don't mind though, because they are all very simple, yet tasteful, which suits me. I never wore any rings until my parents gave me my purity ring and now I wear it all the time on my left-hand ring finger (if you want to know why that finger, email me). I almost never wear bracelets because they get in the way with everything I do with my hands. But for special occasions, my grandmother gave me a lovely bracelet that is the most comfortable I've ever worn. Gaudy or big jewelry has never suited me, because I'm not the type of person who likes to be that noticed. But I've noticed that some young ladies can pull it off quite well. With those exceptions, I've always thought that simple and pretty jewelry is the best and most feminine. Now, would you please share? Feel free to answer all, any, or none of the questions! What are your thoughts on jewelry? Are there kinds of jewelry that you simply won't wear? What are your reasons for this? What is your favorite kind of jewelry? Do you own a piece of jewelry that has special significance to you? I don't have time to do a whole rundown on my jewelry and jewelry philosophy, but I didn't want to give a shout out to Anna, because I'm another girl who never pierced her ears. My parents don't have any objections to it, but I just didn't want to have to deal with the piercings. I do wear earrings, though. My grandmother gave me all her old clip-on earrings, and I wear them all the time. I enjoy the fact that because most clip-ons are vintage they're often very unique and elegant. First off, I have always thought jewelry is pretty and very feminine. I love wearing it because it makes me feel like a princess. I don’t wear a lot, but I do have some necklaces that I wear frequently. I have a really fun watch, but I misplaced it. Other then that I don’t really wear bracelets. I don’t think there are any types of jewelry that I wouldn’t wear. It just depends. I personally really like necklaces. They make a basic blouse pretty and dress up a casual shirt. At a girls Bible study I attend, we made charm bracelets. Each of the charms reminds me of things like submission and sensitivity. My grandmother gave me a locket with my name engraved on it. I have pictures of my parents in it. As far as piercings go, I think earring are just fine. Because of others’ connotations (lip, eyebrow, etc), I wouldn’t wear them. I don’t have my ears pierced because I don’t really have the time to take care of them or try to match my earrings to my outfit. I might someday, though. But I now wear my purity ring constantly on my lift hand. I occasionally wear a strand of pearls or a really nice blue necklace....but only when the outfits work with them. I would wear bracelets, but I have small wrists. People try all the time to buy me some, but they are always too large and seem to fall off my wrist! I very rarely wear jewelry. The 2 things I always had on were my purity ring on my left hand ring finger (I wear mine on my right because I feel like it's a reminder that I'm "engaged" to Jesus and until the man the Lord has for me comes along and asks for my hand in marriage, there my purity ring shall stay) and a simple silver cross. Well my chain to my necklace broke and I started to get sick of having to pull out my cell. So for right now all I ever wear is my purity ring and a simple watch on my left wrist. That's as far as my jewelry goes. But once I get a new chain I'll add my cross necklace to that. I've never been for alot of jewelry, I've never been into a lot of attention and when I wear alot of jewelry I feel like I'm saying "Look at me, Look at me!" What are your thoughts on jewelry? I think jewelry is OK as long as it does not draw to much attention. What are your reasons for this? I can't wear them because my ears get infected. What is your favorite kind of jewelry? I don't often wear jewelry.... but when I do mine is most likely bracelets. In less I'm playing the piano. I think ear pearsing is OK.... but not if it draws attention. I really enjoyed reading this post and comments left so far! I like jewelry and think it's pretty to wear. I don't always wear it though. Like Anna, I forget to put it on, or I find it gets in my way, so some days I wear it and some I don't it just depends on my mood. I have a lot of jewelry, mostly because I love to make jewelry and it just kind of piles up on me, most of it I have never worn though. As far as rings go my favorites are my purity ring and my graduation ring. I have some others I like to wear too. I like bracelets, but sometimes they get in the way. I have some fun ones I wear occasionally, but my favorites is a gray, brown and almond color pearl set my Parents gave me for Christmas one year. I don't wear anklets or toe rings because they get on my nerves and I really don't see any reason too wear them. I don't see the use in attracted attention to my ankles, but that's just my preference. I don't have my ears pierced either. My Parents told me I could when I was 13 or 14 and I thought I wanted them pierced, but than I saw how a friend's ears became infected after she got her's pierced and I decided against it. Since then I have thought about it, but really don't see any use in it. Sometimes I like to wear clip on's. My Mama has some my Grandmother left her, and I like making clip ons. I hardly ever wear them though. I don't have any other body piercings either. Personally it just seems weird and that it would really hurt, and mostly it's not something I want. And most importantly I live in my parents house and they are against any piercings other than ears. Well my comment is long! So I'll end it with saying good post! I'm not sure if there's really anything I wouldn't wear - obviously I don't like all styles, and I probably wouldn't go for the toe rings - but I enjoy lots of different kinds of jewelry. I do draw the line at extra piercings, though - firstly, I think it looks uncomfortable and I can't imagine doing that to myself, and secondly, it can connote things that I wouldn't want to. :) So that's my two cents! I did have my ears pierced for my 13th birthday, but they got infected and we haven't gotten them re-pierced since. I'm not in a hurry, because I've figured out a way to make bead-and-wire earrings for un-pierced ears. Many years ago (I'm fifteen) I bit my nails horribly, and wouldn't stop. Mom ended up taking all hand jewelry away (rings and bracelets) until I stopped. Well, I just ended up going without them for years, and now that I can wear them if I want to, they feel awkward. For me, bracelets generally get in the way. I do have some pretty rings, though, that I wear sometimes. I love jewelry so much. The only thing I wear everyday is my purity ring, which I made myself. It's a thick silver band with a silver heart on it which I wear on my left ring finger. I used to wear a four way cross on a black. I tend to only wear nice pieces of jewlery for special occasions like church. I have many religous medals I might wear day to day, but I'm more of a fan of a short gold necklace. Pearls are classic, so I have a pearl necklace and a pearl bracelet that symbolizes a bible verse. I also have been known to wear very simple jewlery like those rubber message bracelets. I wore them all through 10th grade when I attended a very liberal school, so sending a message was important. Now onto piercings. Our family rule is you can't get your ears pierced till you are 12. I got mine early because it was the only chance I'd be the states, my sister got them late. It depends if you'r responisble enough to clean them. Other piercings tend to send a bad signal, so my plan is to not get any. I wouldn't say there's any jewlery I stay away from as long as it isn't offensive. I think you both made some really good points. The only jewelry I really wear is my purity ring that I got for my 16th birthday (I also wear mine on my left ring finger), and a pair of diamond earrings that I got for graduation. I got my ears pierced when I was 14, but now that I have them I don't know that it is that immportant to me. I like necklaces, but I always seem to forget to put one one. I don't really wear braclets, because I to tend to play with them, more so when I'm nervous. thanks you for all the blog. I really enjoy reading them. P.S. sorry, about any of the spelling, it's not my best subject. Are there kinds of jewelry that you simply won't wear? Anything that includes skulls or stuff like that. And no eyebrow or lip or other just plain strange piercings. Why glorify death when I'm a subject of the King of Life? And "abnormal" piercings I don't wear because then they define you. I'd become "The girl with the lip ring". Ick. Earrings!! We have a family rule that you can't pierce your ears until you're sixteen. But I'm sixteen now so earrings are my new thing. My "purity ring" which I wear on my ring finger on my left hand. I wear it on that finger because when I was little I just knew that that finger was called the "ring finger" so I always wore my rings on it. Then one day my (somewhat senial) grandmother asked me if I was engaged already? (I was probably fourteen at the time) because I was wearing a pretty diamond ring on that finger. So now I keep that finger marked as "reserved" with a thing silver band that spells out the word "love" in pretty scrolly letters. And it won't come off until I have one to replace it from my fiance. I think that piercings on random parts of your body are just plain tacky. With the exception of a small nosering. One that isn't very obvious but creates a pretty, feminine sparkle when the light catches it at the right angle. Sorry about making this comment so long! I prefer to have just a few pieces of quality jewelry than lots of cheap pieces. Thus, I don't wear it every day, but on special occasions, and it makes me feel a bit more sophisticated and feminine when I do. I think jewelry can hold a lot of sentimental value. I have some heirloom pieces from my mother, grandmothers, and great-grandmothers that are special to wear. Some of these pieces remind me of the old days when my great-grandmothers were growing up--I had one who never went out without "prettying up herself," if you know what I mean, and I want to have that same sense of dignity, charm, and loveliness so I am a reflection of the beauty of Christ. After all, I am a daughter of the King, and I want to look like one! Not that I want to be gaudy, but I think you know what I mean: "Her household is clothed in scarlet...she is clothed in fine linen." I hope you don't mind, but I posted my jewellery thoughts at my blog because I wanted to put up some pictures as well. Thanks for giving me something to ponder - I hadn't given the topic a lot of thought, really, until now. Thanks, also, for sharing your thoughts so regularly; they really give me encouragement to work harder. # What are your thoughts on jewelry? I love earrings and jewelery i got my ears pierced when i was around six or seven years old. My mom bought me tiny flower earrings or minuscule hoops so that way i could avoid ear infection. # Are there kinds of jewelry that you simply won't wear? The jump-through the hoop earrings. There so big and unpractical. # What is your favorite kind of jewelry? big bracelets, and my vast collection of earrings. # What do you think about piercings? They are OK for the ears but for eyebrows and other body parts is just odd. I love jewelery...even though sometimes I forget to put it on. The two things I have constantly with me are my purity ring on my left hand and my homeschool class ring on my right. I haven't taken them off since I got them. # What do you think about piercings? Ears are fine. Other places...no way. I think jewelry is very pretty, and I always wear my purity ring. I also always wear my watch mine is fairly simple as well; it is a silver watch with a butterfly in the face. I also wear a necklace most of the time; I just like the look of them. I only wear earrings on special occasions, however, I do NOT have pierced ears, and I never will, I wear clip-on earrings (Anna, you might want to talk to your father about that as an option). My father doesn’t believe in any piercing, and I completely agree with him. My father also believes that earrings should not be too long, nor should necklaces, because if they are too long they draw to much attention to your neck and away from your face. As far as necklaces, he doesn't believe in anything past an 18' chain, because then it is drawing to much attention to your chest. I hardly ever wear bracelets, there is nothing wrong with them, I just don't really care for them, I don't know why. I pretty much only wear my purity ring, but occasionally I wear one on my right hand as well (I, like Miriam, wear my purity ring on my left hand). I don’t really care for pins, I don’t know why (once again). Well, that is my opinion; I have really been enjoying your blog. It's been fun reading all of your responses! To those who have suggested clip-on earrings, I have worn them and my dad is fine with them. However, my experiences with them have been that they really hurt (my ears would go almost numb wearing some for a dance recital once) and fall of easily. I'm sure there are others that are more comfortable, but for now I don't really have a desire to try them. I'm fine with just waiting for pierced ears one day if my husband likes them. Now I'm probably going to be the odd ball here but I have had my ears pierced since I was 3 and I rarely wear earings. I have my belly buttony pierced but I don't put jewelry in it anymore, I had my nose pierced but it fell out,and I have my tounge pierced which no one can ever tell is there because the way I talk it doesn't show. I come from a very liberal family where my mom is fine with piercings because unlike tattoos they can be removed and I did remove almost all of my piercings except for my nose for some time, but the only piercing I have back in right now is my tounge ring. I do have two tattoos though but they are small and covered and I'm happy the way they turned out and I don't regret it. Jewelry wise though I only usually wear my purity ring and thats about it. However, the one good thing about piercings is that (except for tongue studs)they are not permanent. You can simply take them out, and the body heals itself. So I tend to be not so anti piercings as I am tattoos. I really enjoyed your post! I don't really wear jewelry, though I do make it. I think simple necklaces are very feminine and pretty. I wouldn't wear gaudy or very long necklaces because they draw attention to the wrong things. As for piercings, my ears are pierced in one place--the normal place--I would never get pierced anywhere else though. I usually just wear simple studs or small hanging earrings if I go somewhere special.